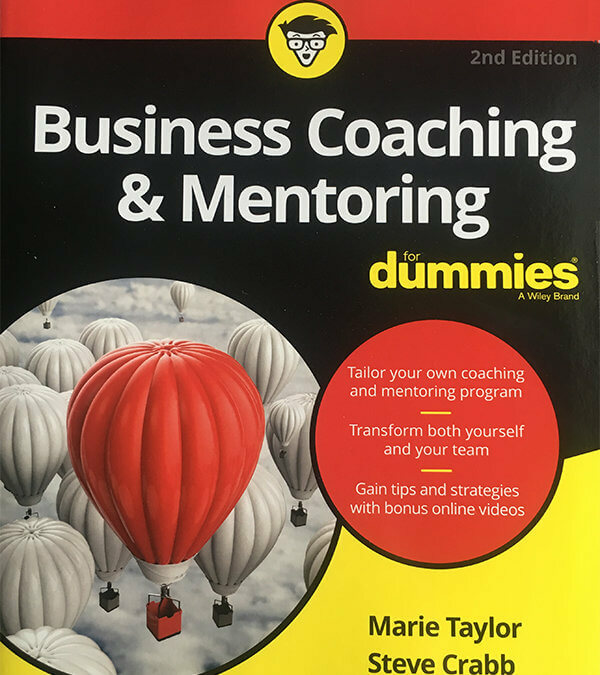 The second edition of Business Coaching and Mentoring for Dummies was published today in the USA. The commissioning and writing of the book and the journey it took Marie Taylor (my co-author) and myself on, is an example of four powerful insights and life long lessons I was reminded of and want to share with you. We don’t know what we don’t know so never stop learning and improving. Plus one HUGE lesson I will share at the end of this posting. There is a back-story worth telling. Initially it may read as self promotion, I assure you it is not, it’s an example of the above four lessons. Marie Taylor my dear friend passed away early this year of cancer and never got to see the 2nd edition published. She was one of the best coaches I have met and worked with, and I have in my time met literally 1000’s of coaches. What distinguished her from so many of her peers was her ability to continually learn and implement what she learnt and her willingness to share her wisdom with others. I first met Marie during a training in New York in 2010 run by my friend Michael Neill. It was Michaels’ first Supercoach Academy and Marie was a student; I was assisting Michael and mentoring a group made up of experienced coaches from literally all around the world. We gathered once a month in New York for 6 months to be trained and mentored by many of the best coaches in the world including Bill Cummins, Mandy Evans, Steve Chandler and Robert Holden. At the end of Supercoach, Marie approached me and asked to join my protégé programme, I was initially surprised as I hadn’t mentioned I ran a year long mentoring / protégé programme and she was already running a successful business coaching practice. When I asked her why I would want to endure spending a year working with her, I remember her laughing because it wasn’t the normal question she had expected to be asked. Her reply was that during supercoach she had heard from other protégés about the programme, and was impressed I wasn’t using Supercoach as a platform to sell my services, she was curious about my unconventional approach to coaching and wanted to be challenged. Music to my ears, I have a low threshold for whiners, victims and dabblers, here was someone worth sitting in a room with once a month. She wanted to know more about the “weird things” I had shared with my mentoring group during our monthly breakfast meetings so she could add them to her toolbox of coaching skills. Every Friday morning before supercoach began I meet my group in a US diner and we explored subjects outside the syllabus of the programme, it was a chance for them to continue to grow and develop their skills and curiosity. Over the six months word got out and other students began to join us and it was simply a fun way to get in a learning mindset. I remember Michael Neill walking into the diner with Robert Holden smiling as he saw over half the group filling up a corner of the diner all with huge grins on our faces loading up with plates of pancakes, bacon and maple syrup. The theme for the morning warm up had been to get into the best learning state possible before the training began. My agreeing to join Michael in New York, then meeting with Marie, then starting the morning breakfast group, was part of what I call following a “breadcrumb trail”, one step leads to the next and we can never be sure where the trail takes us and what it will lead to. I am always pleasantly surprised when something wonderful and exciting happens because of decisions and actions taken years ago. During the year we worked together, Marie attended my seminars on hypnosis and NLP, and was a perfect example of how great coaches (and that includes entrepreneurs) never stop learning. She simply dived into every opportunity to explore subjects which were new to her and she could see would benefit and improve her already great set of skills. One of the major themes for our coaching year together was to explore an opportunity Marie had to coach the senior management team in Wiley Publishing. We looked at ways to pitch and present to persuade and influence and within a few months she secured a contract to coach and mentor Wiley’s for leadership and team building. The contract lasted nearly 7 years and had Marie flying around the world coaching and mentoring a highly successful business team. Fast-forwards a few years to 2014 and I received a call from Marie. Wiley’s had asked her to write a coaching and mentoring book. She realised immediately that there were areas in coaching where she had strengths and weaknesses and the book would be much better if she co-wrote with someone else. I accepted. The breadcrumb trail continued to appear before us and we both kept following the next right step. Many people (coaches especially) operate as lone wolves working with a silo mentality, there is a synergistic power in meeting and working with peers, mentors and people who bring new insights and perspectives to the work you do. Hang out with people who support and challenge you to exceed your own expectations. There is indeed power in the collective collaborative approach. The next year was a roller coaster where we both learnt how much we didn’t know about writing. The Wiley format is very structured and rigid and works well which is why they have sold millions of books. They have a model which requires a writer to follow their guidelines, the model is not intuitive it was a boot camp of a year for us both. I handed a copy of the first edition of the book to a coaching client, a prolific author who has written 3 New York Times bestsellers and presented one of the most viewed Ted Talks, he looked aghast when I proudly handed him his signed copy. “You didn’t write for these guys did you? They are notorious for being difficult to write for” was his response. I didn’t know that at the time of agreeing to the project, and my not knowing was good, because it didn’t get in the way of saying yes and learning a valuable skill. Sometimes we have to acknowledge what we don’t know and immerse ourselves in a new set of skills; this doesn’t mean we have to master all skills. Some people are more passionate and accomplished then we are at certain things and they are the ones to have part of your business / life support team. When we were asked to re-write the second edition book for the US market a conference call was scheduled, Marie was unable to make the meeting, it was the day she had her test results back. The real purpose of this post is as a reminder to get out there, do your work and enjoy it, you never know who it will have a positive impact on, even after you have moved on to the next big adventure. Next public seminar on 25th November 2017 visit Eventbrite for details and to book your place.